We may have entered our second decade in the cloud ERP world, but we’re not slowing down! In fact, as the first day of Acumatica Summit 2019 highlighted, we’re pumping up our efforts and plan to continue our run as one of the best cloud ERP software products on the market. Months of planning have finally culminated in over 1,500 attendees arriving for the start of Acumatica Summit 2019. The turnout has been tremendous (it doesn’t hurt that we’re congregating at the beautiful Marriott Marquis Houston and enjoying the mild Texas weather), and the first day has infused the Acumatica community with excitement for 2019 as well as given them a chance to appreciate the milestones of 2018. Ten years sounds like a long time, but we’ve seen them fly by as we’ve diligently enhanced and improved Acumatica’s cloud ERP solution. Our efforts paid off in 2018. Acumatica’s cloud ERP software garnered six awards, including the SIIA CODiE Award for Best Cloud ERP Solution and Best Manufacturing Solution in 2018 and PC Mag Editor’s Choice for the Best Inventory Management Software of 2018 (more details on our Awards and Recognition for Acumatica Cloud ERP page). And CEO Jon Roskill had some exciting breaking news to impart: Acumatica, for the third year running, has received the PC Mag’s Editor’s Choice for Best ERP Solution! We also grabbed the highest customer satisfaction of all vendors surveyed in Gartner’s latest Magic Quadrant, topped G2 Crowd’s report comparing Acumatica with three competitors in user satisfaction, and ranked highest in usability out of 22 vendors in Nucleus Research’s ERP Technology Value Matrix. He shared with the audience of customer, partner, media and analyst participants that Acumatica has now reached 5,200 customers, 1,200 of whom joined in 2018. With 160 million+ ERP transactions per month (over 1 billion transactions in 2018), 103 million logons per year in 2018 (all with a 99.999% uptime), and 97% support satisfaction, Acumatica’s focus on customer success has resulted in Acumatica’s continued reign as the fastest growing cloud ERP vendor. Part of that customer focus is the importance of digital transformation. Jon highlighted how technology, such as Acumatica’s true cloud ERP, has made an impact on companies’ business management processes that has helped them move forward. “Right at the core of any digital transformation strategy has to be your business software application infrastructure, and that’s what Acumatica is all about,” Jon said. A video featuring Acumatica customer MiiR, a “Product to Project” company that is rooted in stainless steel drinkware with unique gift codes on each item that tracks MiiR’s grant-making and giving process (they give away 3% of their revenue every year), highlighted how Acumatica has helped them be a more connected and digital business. They have found Acumatica to be a simple, scalable, and robust solution as well as one that provides “clean and powerful APIs” and good data leading to good decisions to grow their business. The CEO of Nothing Bundt Cakes, Bill Schaffler, joined Christine Chen, President and CEO of Christine Chen Communications and emcee for the event, and shared with her how Acumatica has connected their 300 bakeries (and growing) across the country, allowing their team to communicate in real time. Acumatica’s cloud ERP solution has also helped them track and forecast their inventory easily and accurately. Finally, representatives from customer Fabuwood, one of the largest kitchen manufacturers in the U.S., and partner NexVue joined Jon on stage to discuss how Acumatica cloud ERP was the right choice for this 800-employee company. Fabuwood was presented with the Acumatica Summit 2018 Customer of the Year Award. Following a conversation on stage with Markus Reithwiesner, the CEO of Lexware, about why they chose Acumatica’s platform, Jon was excited to announce a long-term agreement with international distributor Cegid, the leading business management software provider in France. Jon also announced that Acumatica achieved 88% of new revenue growth for 2018! With the successes of 2018 urging us on, we’re preparing to lead the way in 2019 with innovative technology and top-notch customer service. This, we firmly believe, is evident in our latest release, Acumatica 2019 R1. Attendees at Acumatica Summit 2019 were given a first look at the new product offering. Jessica Gadbois, Partner Enablement Manager, who noted that Acumatica is focused on continuous innovation, demonstrated the enhancements made to different features, including the side panel (which was introduced last year). The performance for this feature has been greatly enhanced with the panel loading instantly; the side panel can also now be minimized and maximized and an expand and collapse button has been added. She also showcased the ability to personalize your website or your instance based on colors, which provides the ability to distinguish color themes between different companies or branches of companies. She also touched on the addition of conditional highlighting in Generic Inquiries as a visual aid, as well as changes to pivot tables. Acumatica 2019 R1 is also adding a processing bar for system admins or implentators who run long processes, showing how many processes are remaining with visibility into customer records. It allows the user to complete other activities in the system then return to the screen with the process still running, increasing efficiency. Finally, Jessica announced an important new feature: multi-factor authentication. Whether through a text or SMS message or through a push notification, users are assured that they and their information are safe. We use this in our own help engine. Jon showed how a natural language search allows Acumatica—behind the scenes—to see how long you spend on a page, if you’ve found the information helpful or not, and then uses it for future searches. The goal is to get more valuable information in a more natural language format. Switching gears, Jon turned to reporting, BI, and data analysis. Acumatica provides the tools needed to make dashboards easy to build and modify. Getting information out, using real-time and customizable dashboards, and acting on it helps drive business. We also have a number of third-party applications available in our ISV community that provide reporting and analysis, and Jon focused on two new ones that, in his words, “have great application for the Acumatica community.” The first one was Velixo. CEO Gabriel Michaud demonstrated the financial and reporting capabilities of Velixo, which he said allows users to build amazing reports with live Acumatica data. And Jon shared about the exciting new integration with Tableau through DataSelf Analytics. This was a much-requested integration, and it provides data insights and analytical capabilities to Acumatica customers’ dashboards. Tableau’s analytics can be embedded in other software, which makes it a perfect complement to the Acumatica ERP platform. Jon then shifted to Acumatica Construction Edition, which was introduced last year as the first version of cloud accounting for the construction industry. We’ve been building integrations to provide an end-to-end scenario for users, which includes rapid releases to increase functionality. We also plan to add more partnerships with ISVs and continue to add to our customer success stories in this industry. “What we’re doing here will translate into some of the other industry editions that you can expect to see from us coming in the future,” Jon said. Going forward, Acumatica with its unified platform, consistent user interface, consistent set of APIs, and our layers of modules (e.g. finance, distribution, management) coupled with our editions (e.g. Commerce, Field Service, Construction Edition), will provide our users with additional editions, either directly from Acumatica or from one of our partners. We’ll also be bringing new technology with AI and machine learning, including zero touch automation, interactive assistance, and intelligent advisor capabilities. Wrapping up, Jon went back to the topic of customers and to World of Hope of International in particular. VP of Finance and CFO Gayle Reitmulder spoke with Christine about how World of Hope helps connect farmers to market. They are a grant-based company and needed cloud ERP software to help them stay compliant and to connect global staff with unlimited user licensing. They also needed multi-currency capabilities. With Acumatica, they increased accuracy and mitigated fraud, among many other things. Jon was pleased to announce World of Hope International as the 2018 Acumatica Non-Profit of the Year award recipient. Acumatica Summit 2019 is just getting started. We’re looking forward to a cloud ERP-focused week filled with breakouts, training tracks, and speakers as well as some fun activities. If you’re not at the Summit, we hope this first day recap will encourage you to attend next year (or you can watch the Day 1 Keynote here). 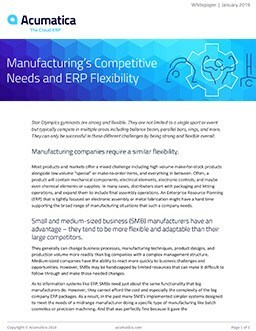 Read our Day One press release here—and if you have questions about Acumatica’s cloud ERP software and ERP platform, please contact us. We’re excited for our customers and partners to experience teamwork, leadership, passion, and innovation in 2019! Users can get real-time information according to their specific profiles and make decision for their daily activities with more autonomy and accurate information. Acumatica is changing the way we work.